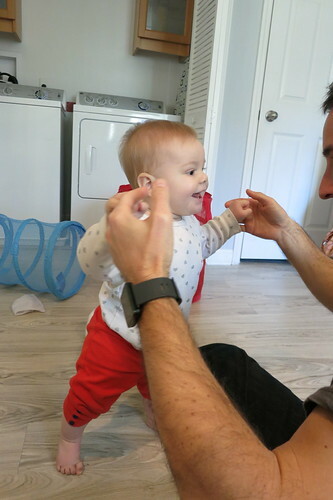 Audra will now sometimes take steps towards Ryan just barely holding onto his thumb. 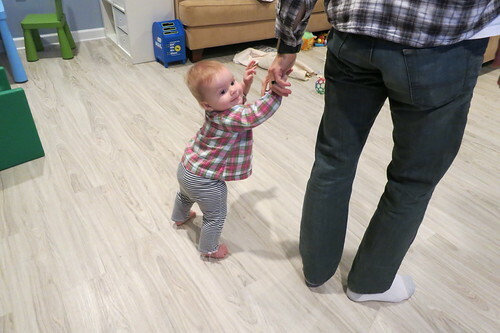 She won't try walking on her own quite yet, but I have a feeling it won't be much longer. She has been doing quite well walking holding onto two of our hands, and can now walk with just one hand, as long as she doesn't get too distracted ;) I'm actually looking forward to her being able to walk - she already gets into quite a bit, so it's not like that's going to be much of a change (although we do still need to barricade off the stairs...), and I'm really just hoping that being able to walk might help ease some of the crying. Despite how quickly she can crawl now, she still gets quite upset if we walk away from her too quickly, and hopefully she won't feel like she's being abandoned once she can walk too and keep up with us more. Audra is cutting at least one more tooth right now - her left eye tooth started coming through last weekend, and the right one is now bulging just below the gums, if it hasn't broken through already (she's not exactly cooperative when I try to check). So she has 5-6 teeth still emerging right now, and she is just a trouper - very little (additional) fussiness, hand-gnawing, or difficulties sleeping, and no fever. She only rarely drools - despite all the teeth coming through - and actually, she doesn't spit up either, except for if I've eaten something I shouldn't have (like dairy - she can tolerate some amount in my diet, but I apparently crossed that line last week since she spat up a few times). This is also a big difference from Josie. 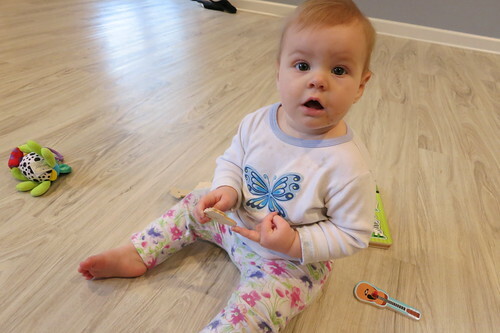 So we definitely had a "laundry problem" with Josie with all the spitting up that she did for about the first year, while Audra's "laundry problem" is - to avoid being too graphic - from the other end. She still has poo blowouts every.single.time (this is with changing her immediately, trying different diapers and sizes, etc. 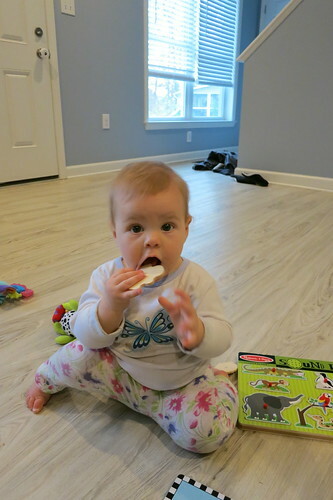 ), but this looks like it will be resolved soon as we switch over to more solid foods. 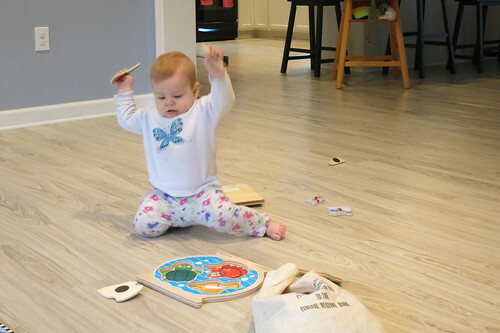 Audra and Josie have had a lot of fun playing together lately. Josie continues to build up block towers for Audra to knock down, and they've started doing puzzles together too... sort of. 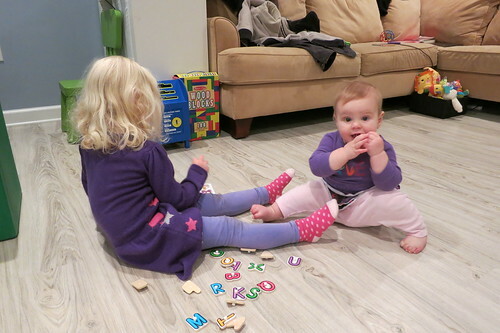 It consists more of Josie attempting to do a puzzle while Audra tries to grab and taste-test every piece that she can. 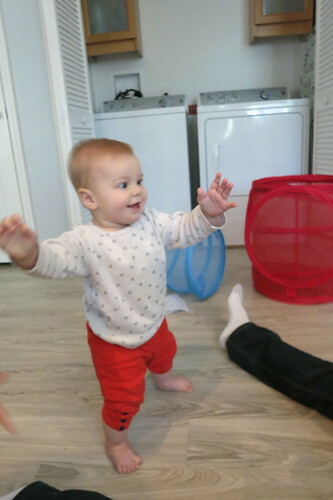 Our daycare provider thinks that Audra has started dancing, but I think it's more just that she's REALLY EXCITED about certain things, which just so happens to include music :) She has been flailing her arms around and yelling when she likes things, and now has added bouncing to the mix too, which is just super cute. 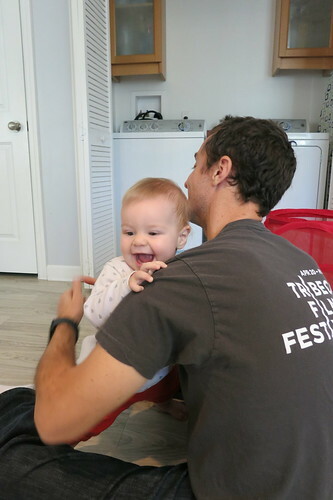 Back when Audra was first born, our go-to activity to calm her down (besides nursing or walking her in the carrier) was to put her on her change table. 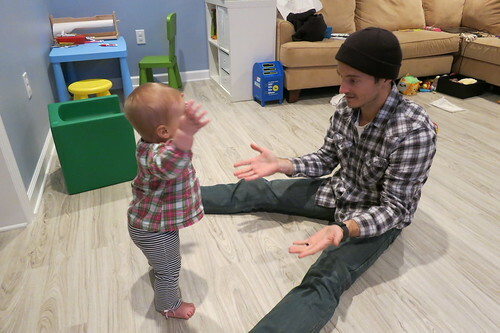 Now she almost always HATES it with me, and will just scream (in an almost amusingly angry manner) whenever I set her down, although she does a lot better with Ryan now (i.e., I hear belly laughs from the both of them when he changes her). So now my replacement go-to activity for her is to give her some food. This kid loooves food. 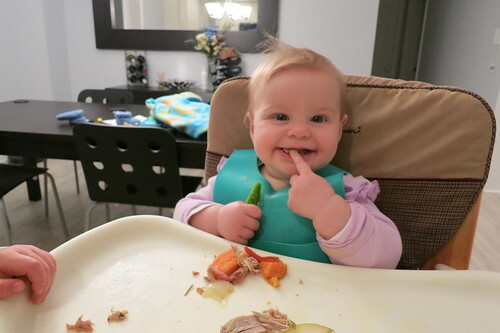 She calms right down (well, besides the excited arm flapping) as soon as I put her in the high chair, and she just attacks any food I put in front of her (including green pepper, sweet potato, carrot, pear, and pulled pork for this week). 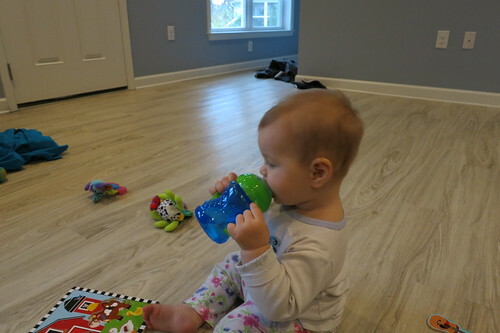 She's also starting to learn how to drink out of a sippy cup - she's quite interested in drinking from it, but hasn't quite figured out how far back she needs to tilt her head yet.